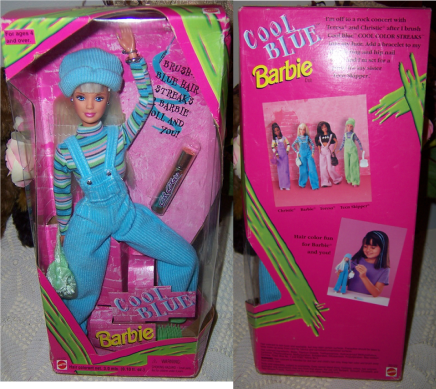 Barbie is off to a rock concert with Teresa and Christie but first she needs to brush "Cool Blue Streaks" into her hair. Then she has to put on her bracelet, thumb ring and nail colour. She is all set for a party for her sister Teen Skipper. Barbie is the only doll for sale, and has never been removed from her box. The box does show some shelf wear. 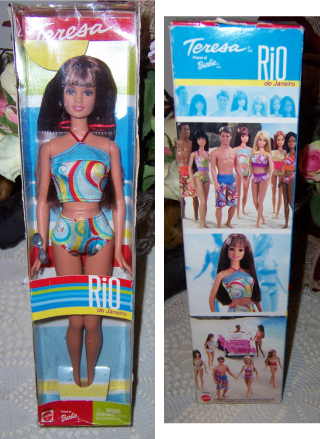 Theresa is a friend of Barbies and she is holidaying in Rio De Janeiro. She is in her original box and has never been removed. The box does show shelf wear - circa 2002. Teresa is wearing her multicoloured swimsuit and has a pair of sunglasses. She has brunette hair with auburn highlights and is brown eyed. 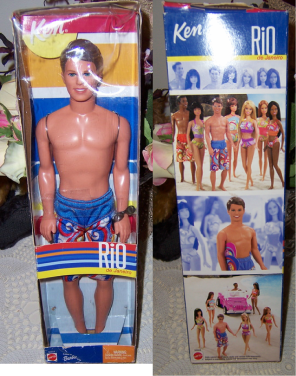 Ken is holidaying in Rio De Janeiro along with Barbie's friend Teresa. He is wearing his bathers, and has a pair of glasses for the sun. Ken has molded hair and is blue eyed. He has never been removed from the box. The box does show some shelf wear - circa 2002. These cards are a great find, and show the fashions of Barbie over the years. If you collect Barbie clothes then these cards are a great way to find out what clothes belong to what set. outfits - Pink and Pretty, Black Sheath, Gold Medal Barbie, Montgomery Wards, Quick Curls, Living Barbie, Pretty as a Pictures, Lamb n' Leather, Holiday Dance, Golden Evening, Roman Holiday, Senior Prom, Angel Face Barbie, Pink Evening Gown, Braniff Welcome Aboard, Best Buyrs, Evening Elegance. We also have what we believe to be an original advertising box which would have sold the packets of cards to the public. It is very worn with old sticky tape around it to keep it together and has childs hand writing on the inside of the lid - see photo. These 63 cards would be a wonderful help to identify Barbie clothing over the years. Barbie is dressed in a bright pink dress with pink high heeled shoes, pink head piece, and a gold handbag. Her hair has stripes of pink in it. The hair changes to light pink when heat applied, and when cold applied the pink becomes quite bright. We have also given her a pink hairbrush for her lovely sleek blond hair. 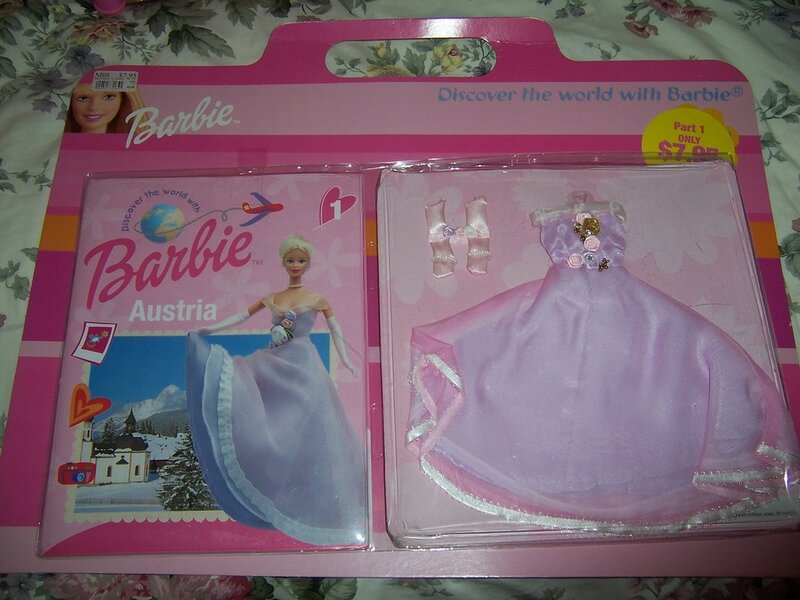 This is the very first outfit to collect from the series called ''Discover the World with Barbie''. In this series Barbie visited over 38 countries around the world and she would dress up in a different outfit for each country. There would also be a book/magazine to read about that country as well. Our outfit and book is about Austria. There is a gorgeous mauve and pink evening dress with long pink gloves. 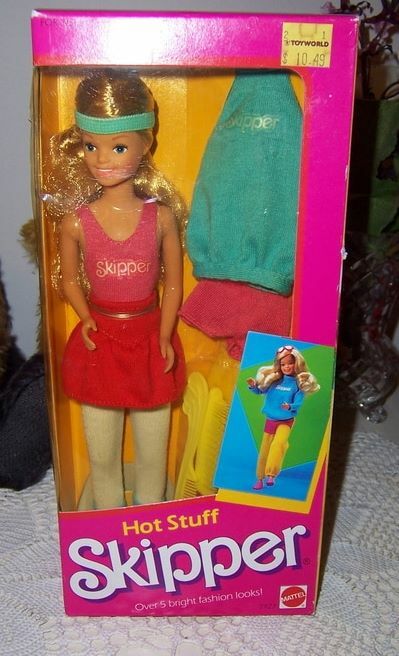 This is a Skipper doll in her gym clothes in her original box which has never been removed. The box states that you can created 5 different looks. The box may have a little wear to it, and a side split to the cellophane , but really in great condition. 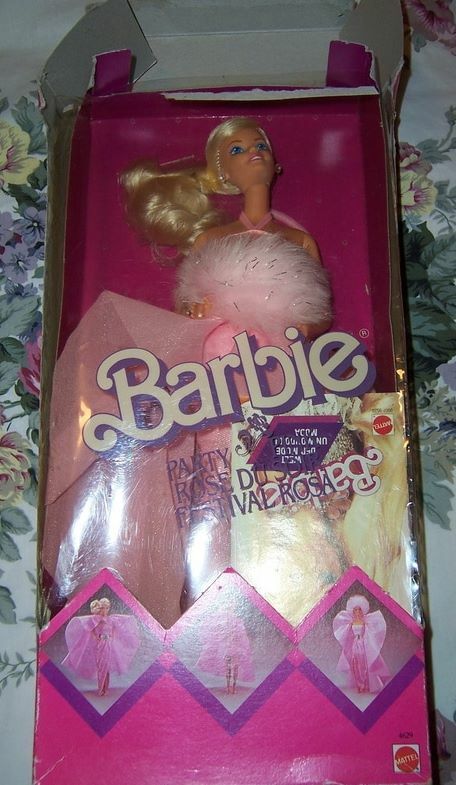 This 1987 Barbie doll is indeed a rare item. She is a doll from overseas - Canada from Mattel. There is writing on the box in two languages - French & English. Barbie is dressed in her very glamorous pink evening dress. She is still attached to her original box and has only been taken out for pictures (still attached to the card). However the box shows a lot of wear and the top has come undone. See photos. DO YOU NEED THIS DOLL FOR YOUR COLLECTION? Nichelle is a pretty doll and has been redressed in a gorgeous home made Wedding outfit. It cannot be removed and has lace on leg, wedding bouquet, long veil , embroidered satin Wedding dress, and white high heel shoes. Nichelle has a movable head and a twist and turn waist. She is a gorgeous Bride. A lovely rare Barbie doll.